A panel of top scholars presents the first comprehensive collection of primary sources from Unitarian Universalist history. 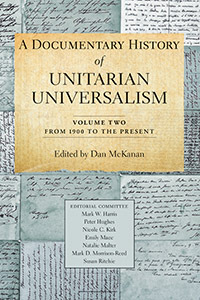 This, the second of the two-volume set, covers the history of Unitarianism, Universalism, and Unitarian Universalism from 1900 to the present, including a wealth of sources from the first fifty-five years of the Unitarian Universalist Association. From Clarence Skinner and James Luther Adams to Jack Mendelsohn and Rebecca Parker, this rich anthology features leaders, thinkers, and ordinary participants in the ever-changing tradition of liberal religion. This volume contains more than a hundred distinct selections, with scholarly introductions by leading experts in Unitarian Universalist history. The selections include sermons, theologies, denominational statements, hymns, autobiographies, and manifestos, with special attention to class, cultural, gender, and sexual diversity. Primary sources are the building blocks of history, and A Documentary History of Unitarian Universalism presents the sources we need for understanding this denomination’s past and for shaping its future.